Median Price is merely the mid-point of the trading range for each period. The line is plotted on the price chart and can be used as a filter for trend indicators. Median Price is featured in Steven Achelis' book, Technical Analysis A-Z. Coca Cola is plotted with 21-day exponential moving average, and daily median price. 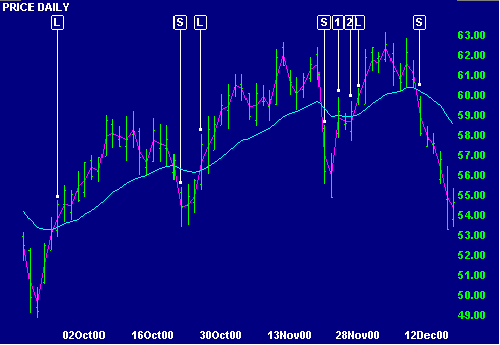 A Single Moving Average System is used with median price as a filter. Long [L] and short [S] trades are signaled when median price crosses the moving average. The median price filter eliminates an unprofitable trade at  but delays the signal by an extra day at . See Indicator Panel for directions on how to set up a median price on the price chart. Edit Indicator Settings to alter the default settings.